Obituary for Gerard J Goguen | Boucher Funeral Home, Inc.
Gerard J. 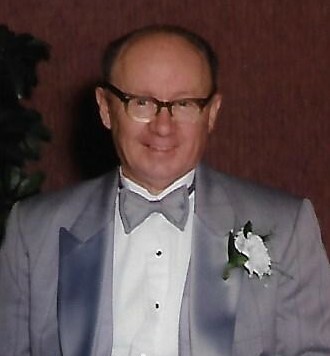 “Gerry” Goguen, 99, of Leominster, formerly of E. Templeton, died peacefully Sunday, February 3, 2019 in Alliance Health at Baldwinville. Born in Gardner on February 15, 1919, he was the son of the late Saul and Henrietta (Leger) Goguen. Gerry graduated from Gardner High School with the Class of 1937, and earned his Associates Degree in Accounting from Becker Junior College of Worcester in 1942. He was a United States World War II Army Veteran and received the Good Conduct Medal, American Theater Ribbon and World War II Victory Ribbon. Gerry was owner/operator of Chair City Beef of Gardner for 42 years, retiring in 2000. He was previously the Accountant for Gardner Beef from 1947 through 1958. Gerry was a member and one of the original founders of Holy Cross Church of E. Templeton. He was President of the Men’s Club and participated on many planning committees for social activities and fundraisers. He was a Collector for over 56 years, and was a Parish volunteer with the annual Bishop’s Fund for many years. Gerry was a member and Past Grand Knight and a member of the 4th Degree Bishop Bevan Council of the Knights of Columbus Council #2536 of Otter River, and he was a member of the American Legion Post 129 of Gardner. Gerry enjoyed reading, watching television and working. He was an avid sports fan of the New England Patriots and the Boston Red Sox. He most enjoyed spending time with his family. Gerry was predeceased by his wife of 73 years, Alice M. (LeClair) Goguen who died January 6, 2019. He leaves his sons, Dennis G. Goguen of E. Templeton and Philip E. Goguen of E. Templeton; daughter, Theresa M. Beaudoin of Leominster; grandchildren, Katherine Goguen of Templeton and Stacy Lucier of Fitchburg; several nieces, nephews and cousins. He was predeceased by his three brothers and three sisters. A Funeral Mass for both Gerry and his wife Alice will be held Wednesday, February 13th at 12:30 p.m. in St. Vincent de Paul Church, 1 Forest Street, Baldwinville. Burial will be in the MA Veterans Memorial Cemetery, 111 Glenallen Street, Winchendon. There are no calling hours. Friends and family are asked to report directly to the church the day of the services. Memorial contributions may be made to Ahimsa Haven Animal Rescue, 381 Baldwinville Road, Templeton, MA 01468 or to Alliance Health at Baldwinville, Activity Fund, 51 Hospital Road, Baldwinville, MA 01436. Please reference in memory of Gerard J. Goguen.